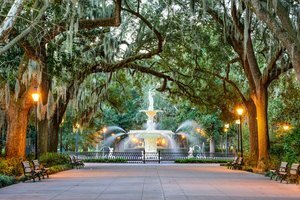 Stay at our hotel near Forsyth Park in Savannah, GA and escape to one of the city’s most picturesque parks. This historic city park is popular among tourists and locals alike, and features winding paths, flowering gardens, and a stunning fountain. Spend an afternoon walking in the park, one of Savannah’s most iconic and photographed areas! Directions: Drive 19 minutes or 15 miles from our hotel near Forsyth Park along the I-95 N. Take exit 165 from I-16 E. Follow Ogeechee Red to W Anderson St and then Drayton St. The park is located south of Gaston Street and north of Park Avenue. There is lots of street parking and public parking areas on the east side of the park. Public restrooms are available in the park. Plan at least an hour to visit the park and wear walking shoes. After the sun goes down, the park has street lights on until 11 PM and a light show across the fountain. This wonderful green space is popular for wedding and event photography, thanks to the lush backdrop of moss-covered oak trees. The fragrant air smells sweetly of dogwood, red buds, and azaleas in bloom. 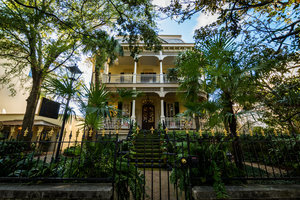 For visitors interested in Savannah’s historic architecture, many beautiful Victorian homes line the perimeter of the park. Stop by the Saturday Farmers Market by the tennis courts for crafts, local produce, and baked goods. 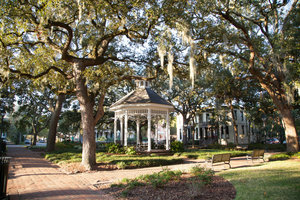 Forsyth Park is also home to a children’s playground, basketball courts, and local theatre. Looking to spend more time outside? Forsyth Park is just a 14-minute walk from Colonial Park Cemetery, the oldest surviving cemetery in town. Visit as many of the 24 park squares located throughout the Historic District as you can. Take a Ghost City Tour through Savannah’s famous Bonaventure Cemetery, Factors Walk, Haunted Fort McAllister, and an underground world of tunnels. Book your stay at our hotel near Forsyth Park in Savannah, GA for a relaxing trip down south!